We do not stock all the colours shown in these charts. Unlike liquid paints which can be blended at a mixing station, powder paint goes through many expensive stages before it is ground to a useable powder (about the same consistency as talcum powder). We stock over 200 colours for our everyday use. Each box of powder usually weighs 20kg and has an approximate value of a £145. Before powder coating, all painting was liquid based and in the UK used British Standard colour schemes BS 318C and BS4800. Powder coating is mainly used for the construction industry and as such uses the RAL colour scheme. 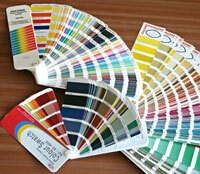 If a colour needs to be chosen, ensure it is one from the RAL scheme. The BS colour schemes are being phased out and only limited stock colours are available. The RAL colours are identified by 4 digit numbers. Typical example of a RAL number for a green similar to British racing green is RAL 6005. The picture shows a RAL, Pantone, and a Dulux chart. Most colours can be matched including metallics. Specially matched powders cost around £370 for a 20kg box.